This is Millie, diagnosed with Pannus last week. I wanted the doggles for when it's particularly sunny and when we can't avoid it. They fit and look lovely. Millie is a retired racing greyhound from Hall Green Retired Greyhound Trust. We love her to bits. She's five years old and in good health. After a spell of sunny weather we noticed Millie had a pink growth on the outer right of her left eye as well as Millie starting to squint. An appointment with an Ophthalmologist confirmed Millie had Pannus. The condition reacts to and is made worse by UV light. We've started treatment which should hopefully save Millie's sight. I also wanted the doggles for when it's particularly sunny and for when we can't avoid the sun. Here is Millie trying her doggles on for the first time. They fit and look lovely. Thank you. 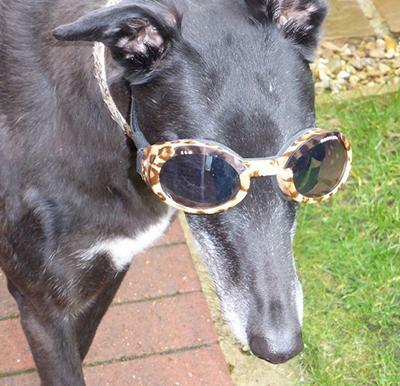 A few weeks ago, after my 7-year-old greyhound, Flora, was diagnosed with pannus, the vet recommended that she should wear Doggles. I ordered a glamorous animal print pair from you. They arrived promptly and, after a little initial reluctance, Flora now wears them happily. As someone said, all she needs is a scarf and she’d look like Audrey Hepburn. It is good to know that, in addition to the eye-drops, I can do something else to help save her sight. 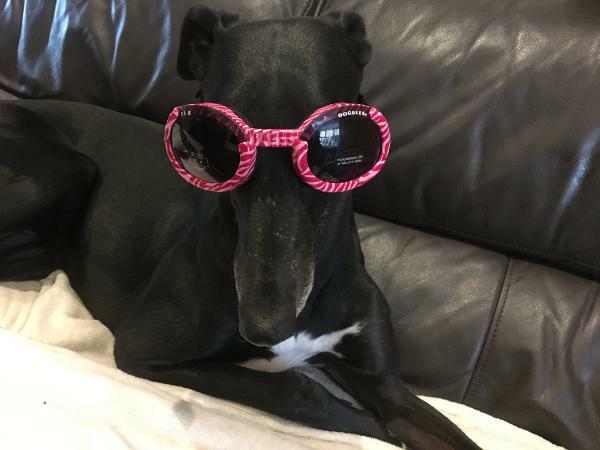 When I put this photo on the two retired greyhound owners’ Facebook groups to which I belong, it triggered a great deal of interest and overnight Flora has become something of a poster girl for Doggles. It’s interesting that although people are prone to point at her when we are out, other dogs take not a scrap of notice of the fact that a dog is wearing shades.